The first business day of 2009 was more than passably strange. Equity markets were buoyant and the news could arguably have not been worse. 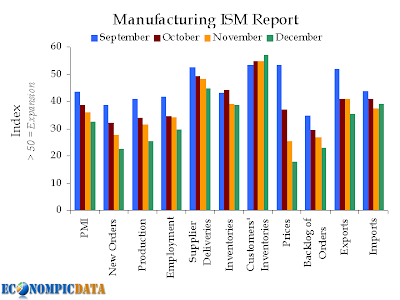 I tend to ignore the stock market, at least in the short term, so let’s just assume all of the buyers showed up today and the sellers took an extra day off and concentrate on the ISM manufacturing numbers. The current recession is likely to differ from those of the past. Unlike most recessions this down cycle stemmed from an asset market correction that impaired financial balance sheets and froze the credit system – not by monetary tightening. Coincident and lagged economic statistics seem to line up with a typical recession, but forward looking statistics present a picture of continuing economic deterioration. If it is true that “it is always darkest before the dawn” then daybreak must be very near because these are really black numbers. Maybe that’s what the stock markets are thinking.